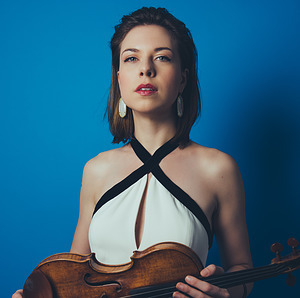 The Ashmont Hill Chamber Music series scored something of a coup by bringing rising violin phenom Tessa Lark in for a rare Boston appearance Sunday at AHCM’s usual venue at Peabody Hall of All Saints Church, Dorchester. The Eastern Connecticut Symphony Orchestra was on fire Saturday night at the Garde Arts Center, and violin soloist Tessa Lark appeared to be the spark. A crowd of 700 at the Garde gave the most extended standing ovation of the season to Lark, who came onto the stage with a shimmering dress and broad smile before absolutely tearing up the joint with a concerto titled "Sky" by contemporary composer Michael Torke, who wrote the piece co-commissioned by the ECSO after being inspired by Lark's energetic playing. Sky is a bluegrass inspired violin concerto written for Tessa Lark. It's the latest in a long string of ASO commissions of Michael Torke, who Music Director David Alan Miller called "about my favorite composer in the world." Miller's allegiance is not misplaced. Torke writes music that is energetic, tuneful and brilliantly orchestrated. The new concerto is among Torke's best, right there alongside his 2015 piano concerto Three Manhattan Bridges. The opening sounds of Sky come from the violin and the tambourine. There's an immediate feel of country music, but also the noble spirit of Copland. In a piece tailored to her strengths, Lark played with apparent ease and unaffected beauty. The violinist, who has appeared with dozens of American orchestras and is a Naumburg winner, among other prestigious awards, made an impressive recital debut at Matinee Musicale ... She made her Cincinnati Symphony Orchestra debut at age 16. Now 29, she plays with an easy virtuosity. But she also charmed the audience at Anderson Center on Thursday with her down-to-earth personality and sense of humor as she spoke about each piece that she was performing with her pianist, Andrew Armstrong. The 25-minute Red Violin: Suite is culled from Corigliano’s score to the 1998 François Giraud film of the same name and uses a haunting chaconne as its organizing principle…When the solo part featured a soft, ghostly melody in the extreme upper register, Lark was especially secure, her intonation and tone control pristine. Some variations turned fast and furious, with heavily accented 16th note and triplet patterns, overlaid with double and triple stops. In these showier passages, Lark ratcheted up the intensity, applying quicksilver bow strokes, perhaps carried over from her work in bluegrass fiddling and Appalachian music…Lark was a persuasive advocate for this modern but readily approachable music. The projectile whizzed past Tessa Lark’s ear just as she was trying to put into words what makes the Marlboro Music School and Festival here so special. Ms. Lark, a violinist, was eating dinner last Saturday at a long table crowded with musicians and their families. Later in the evening, she was to perform Brahms’s Piano Quintet alongside the pianist Mitsuko Uchida, Marlboro’s artistic director. Is it okay to play bluegrass on a Stradivarius? The answer, of course, is "yes," but violinist Tessa Lark did wrestle with the question ... "At first I felt bad playing bluegrass on a Stradivarius. But it turns out that it sounds really great on a Strad," Lark said, "and bluegrass music deserves as fine a violin as any genre of music." It was clear right away that this concerto was in very good hands, as she sailed through the first movement, carrying off those high notes with confidence and control. At the same time, the lady in red was not a grandstanding musician. She communicated deep concentration. The Adagio was the highlight. Lark showed a glorious legato singing tone in that sublime opening theme, and gave just the right whimsical touch to the trilling birdsong that comes a bit later. She has a stellar sense for dynamics. Tessa Lark’s appearance last Sunday in the Phillips Collection’s weekly concert series was a touchstone of the Washington concert season. Lark’s performance specialty is communicative immediacy, removing the violin from its above-it-all “diva” status among orchestra instruments into a direct narrative interplay with the audience’s ears. The Phillips Collection presented two dynamic musicians of the millennial generation, violinist Tessa Lark and pianist Roman Rabinovich, in an excellent recital Sunday at the Cosmos Club ...The duo made a stellar combination in two slightly older pieces, beginning with a richly interpreted, smoldering performance of the first violin sonata of Brahms ... Bartok’s first violin sonata, which brought out the more explosive side of both performers, ended the program ... [Lark's] “Appalachian Fantasy” ... combines classical and bluegrass idioms more naturally than the work of her mentor, Mark O’Connor. Lark and Armstrong gave an imposing performance that appropriately achieved symphonic proportions while also finding the movement’s many introspective passages. Tessa Lark ... displayed both an abundance of energy and great technical discipline. She cleanly dispatched what Corigliano calls “knuckle-breaking double harmonics” in the second movement scherzo, delivered an arresting recitative followed by flautando effects in the Andante, and proved to be rock-solid in the challenge Corigliano throws at the soloist in the finale — to play intentionally out of sync with the orchestra as soloist and ensemble accelerate the tempo at different times. CityMusic Cleveland soloist excels in Corigliano's "Red Violin Concerto"
Lark has fully mastered the daunting score, and her performance Thursday night was a marvel of emotional concentration, technical prowess and not a little showmanship. The Troy Chromatics launched its 121st season on Friday evening with a return engagement of the American violinist Tessa Lark with pianist Ellen Hwangbo... Lark’s 2014 debut in the series is widely remembered as a triumph. Friday evening’s concert confirmed that Lark is an accomplished and expressive artist worthy of all the fuss. It’s astonishing that it has taken almost 20 years for Edgar Meyer’s Violin Concerto to be heard anywhere in Illinois, let alone Chicago... [and] Tessa Lark provided superb advocacy as solo protagonist. She coaxed a gorgeous tone from her "ex-Gingold" Stradivarius and was wholly in sync with the music. Lark, a native of Kentucky who won the Avery Fisher Career Grant this past year, was playing this concerto for the first time in four appearances with the South Florida Symphony. Her Boca performance was the first time she’d played it in public, and she did so with sparkle and accuracy, carefully carving out the yearning opening theme with precision and suavity and making short work of the acrobatics that followed. Young violinist Tessa Lark has an unerring sense of pitch combined with a formidable technique; she easily navigated her way through the difficult cadenza in the first movement of the concerto, then through the melodic filigree of the second, and finally through the knotty technical problems of the rondo. To the rescue [in Mozart's Violin Concerto No. 3] came violinist Tessa Lark, the 26-year-old budding superstar who recently received an Avery Fisher Career Grant. Not only did the Kentucky native solidify the ensemble, she provided a lovely lyricism and rhythmic inflection that connected palpably. Cadenzas were beautifully rendered and infused with playfulness, sighs and effortless double- and triple-stops. While not a forceful soloist, she projected Mozart’s elegance with warmth and conviction. Lark played with a maturity beyond her 26 years, and her navigation of the sprawling structure of the linked first and second movements showed a fine understanding of the composer's dramatic intent. Her tone was rich and colorful ... and more than once her confidence, as she attacked the highest reaches of her instrument, drew a murmur of appreciation from the audience. Tessa Lark. Who is that, you ask? Go to Google for details; for now, know that she is a highly skilled violinist who will absolutely make you sit up and pay attention. Whatever the performance category — accuracy, tonal quality, musicianship, energy, etc. — she is one of the best young violinists you will ever hear. Lark is that rare performer who transforms classical music into a full body experience, captivating to watch, yet projecting an authenticity that feels as genuine as her musicianship. The concert concluded with a terrific rendition of Bartok’s Piano Quintet by the violinists Tessa Lark and Amy Galluzzo, Mr. Mosloff, the cellist Michael Dahlberg and the pianist Nicolas Namoradze, whose sensitivity and coloristic playing enhanced the bristling, high-energy performance. It was crisp, the rhythms and articulations were precise and immaculate, their technical passages had superb clarity and the energy was high. Tempos were lively and the musical phrasing was strong. The finale with its offbeat rhythms was a joyous romp. The winner of the 2012 Naumburg International Violin Competition, Lark opened the program with one of the most profound — and daunting — works in the repertoire: Bach's Chaconne from the D Minor partita for solo violin. Lark immersed herself in the 15-minute work's emotional struggle, texturing the brooding passages in both dynamics and pacing. Her approach to this revered score was utterly situational, at times in mourning, at times seething, often contemplative, and occasionally racing in terror from unseen hellhounds. When the hymnlike major key central section began, her phrasing was achingly fragile and exposed. She swayed as she stepped out bravely into the rising figures in scales, ending with high and mighty ringing cadences in stops, before a fall from grace — and the major — her face masked in pain. At the conclusion, the audience gave her repeated ovations. Her performance was, quite simply, electrifying. Tessa Lark’s recital of violin music on Wednesday evening, in the Weill Recital Hall at Carnegie Hall, was a brilliant showcase of a promising young virtuoso, carefully planned and beautifully executed. Ms. Lark, a tall, slender Kentuckian, took instant command of the solo part, with a rich, plummy tone somewhat reminiscent of David Oistrakh, and a powerful sound even in the most ethereal upper reaches of harmonics and ordinario. As a winner of numerous competitions and prizes, she is already becoming widely known; but she is definitely one to watch.